I have always been a reasonably fit person most my life, my livelihood as a wildlife cameraman and photographer depended upon my fitness. Brought up on home cooked food (meat and three veg), I'm not a great fan of convenience food and because I don't like the taste of it, I do not drink any alcohol. This meant my weight never seemed to be a problem. Then in the winter of 2014 I contracted pneumonia with pleurisy along with a collapsed lung. Then to cap it all.. I was diagnosed with prostate cancer. I had to quit work in order to get my life sorted out, thankfully the cancer was caught it time and is now benign. In that three years of illness, my weight ballooned, I went from a 34 inch waist to a 42 inch one. I would eat for the sake of eating mainly down to the medication, boredom and slight depression. My blood pressure had become high, I had tingling sensations in my finger tips and I seemed to have a constant cold and felt fatigued all the time. To cut a long story short. 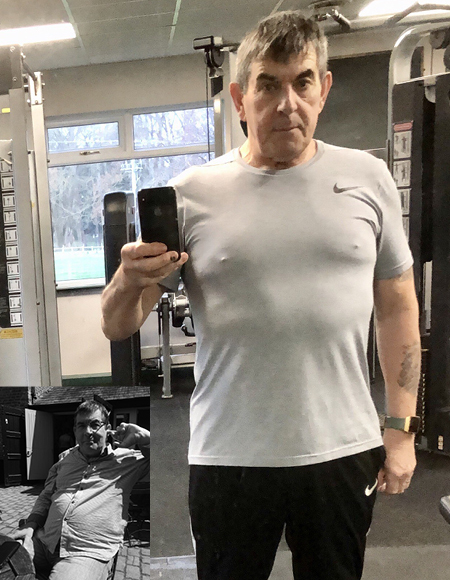 I was in the garden on Sunday 25th March 2018 (a date I will always remember) shuffling around, feeling down, clothes not fitting, out of breath, over weight by 4st56lbs25.4kg and I thought... this is not me. So I dusted off the treadmill in the garage and on the Monday started slowly training again. Three months later I had lost just over 4 stone and was back to my normal weight and waist size. In hindsight, I went way overboard on the exercise front doing over 2 hours a day, 7 days a week to start with. At first I had no idea about dieting, calories, saturated fats etc. I looked up what calories I should be eating for a man of my age and used the NHS BMI guide for my weight guide. I did a spreadsheet of what I was eating, looking up the calories on the web, read and watched conflicting and confusing stuff on weight loss. All wanting to make money out of you. Then by a stroke of luck I discovered Nutracheck whilst searching my Fitbit for suitable Apps. Wow - not only did Nutracheck sync with my Fitbit, it also took all the worries away from counting the calories and looking up my food - along with the forums for loads of support and help that put me on the right track. Now I am maintaining my weight and eating healthier. I've joined a gym, off the medication, feeling in the best of health, my blood pressure is back to normal with no tingling sensations in my fingers and my resting heart rate has gone from 63 BPM (beats per minute) to 50 BPM. My short journey to weight loss has been a big learning curve and without doubt the major help in that journey, along with my determination and willpower, was Nutracheck. I will continue to use it as my health guide, a small price to pay, when everything you need to succeed is there all ad free. Make full use of Nutracheck as it is your best friend to a healthy lifestyle. Eat healthy and stick to the calories Nutracheck set you - it works. Although your diet is the most important factor of weight loss, exercise (no matter how small) is also important, it keeps your muscles and bones strong. Set yourself reasonable short-term goals to achieve i.e. weekly targets. Promise yourself a treat as a reward. Never be afraid to ask for help or advice.